The wait is over! 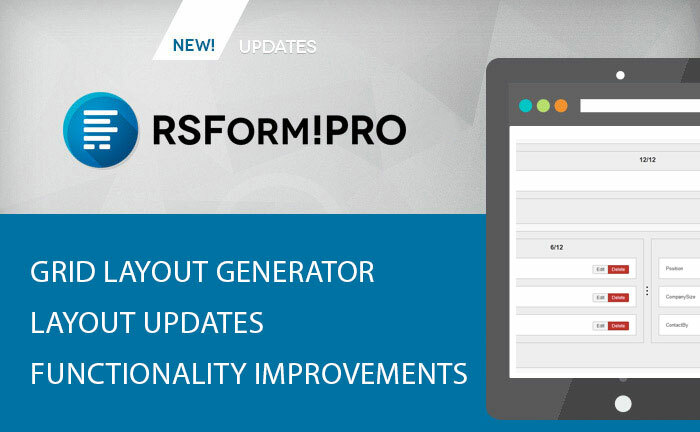 RSForm!Pro 2.0 is here, ready to enhance your business. You've asked, we've delivered. The new component version delivers a powerful, yet simple to use Grid layout generator. This means that you no longer need to manually edit the code from the Form layout tab in order to line up multiple fields on the same row. You can even control the size of each column and move fields around using a drag and drop functionality. Creating a custom layout for your form has never been easier. The new version also includes two new default layouts compatible with UiKit 3.0.0 and Bootstrap 4. Read more in our Form layout article. We are always listening to our customers feedback and along with this update we also performed a major overhaul across the entire component. Lots of features have been improved to ensure a better experience when building up your forms. You can read the full list in our component changelog. Users atached three files in the form. I recieve by e-mail only one. Is it possible to edit records from frontend for a specific group of users? I would need this function for a client who needs to mark a submission as "accepted" or "rejected"
I would like to get a complete email in my mail box, not only the message "You have a new submission." I would like to get a complet email in my mail box, not only the message "You have a new submission." First of all, the grid layout is awesome and saves a ton of time over custom CSS or custom layouts. Is there a way to control the tabindex? On forms with multiple columns, I would like the user to move across when hitting TAB instead of down. I think this is great! Thank you. I still really wish there free text editor was an option. Since HTML is supported it's a pain to code this or open an article to create the content and copy the HTML code. Even a simple editor would be OK even if it's not the full JCE or whatever. Thanks for listening to customers and staying ahead of the curve. Having multiple column layout is crucial and the Grid Layouts makes this super simple. Please (please, please,please) add an additional attribute to the 'Free Text' from field so that we (and our clients) may add classes (H1, H2, H3, etc.) to the text for styling purposes. This would make things so much easier than adding the tags in manually for every heading and paragraph. The arrival of the grid layout generator will be a massive step up for your component and is the one major feature it's lacked so far, so it's great to see it being introduced. Looking forward to trying it out.